When people think of Haiti they tend to begin to dive directly into the negative thoughts. They often talk of poverty, of suffering, of disaster, and of danger. However, when I think of Haiti I think of the eyes, and the children behind them. In my short time in Haiti I spent a little bit of time in the orphanages playing with the children, and I can’t think of another place in the world as inspiring. When we see such despair in the world we begin to wonder if people are innately bad, if they are born selfish, savage, and heartless. However, it only takes a couple minutes with children to realize that’s not the case. Children, even when they have nothing, can do nothing but offer love and look for love in return. Their smiles pierce the amour of our shyness, their laughs can’t be anything but contagious, and their smiles, well, seeing their smiles makes us see the good in human kind; as cheesy as it might sound. The below photo has an edge to it. I love the mood it shows, but the mood portrayed in the photo is not actually the mood that was felt in the room. That room might have been one of the happiest places I have ever been in my life. There will be more Haiti articles to come over the next couple of weeks. This shot is actually one of those moments you realize that practice makes perfect. When I began shooting photography I had to keep telling myself things like “get down to their eye level”, “keep the subject out of the center of the image”, and I would often struggle getting the settings set quick enough to capture the moment. However, in taking this photo everything just came naturally. As a beginner I likely would have missed this shot, along with many others in that room in Haiti, it was busy and had a lot going on. I guess shooting a DSLR, in many ways, is like playing with a new video game controller. At first you struggle to find the right buttons in the right situations and you lose, but then after a while it becomes an extension of your hand and you start to win. There is no way for that level of comfort to come without playing a lot, so get out there and play. I shot this image in a dark room, so I shot my 50mm lens since it is the fastest lens I own. I cranked the ISO up to 400 to get a little bit more speed. 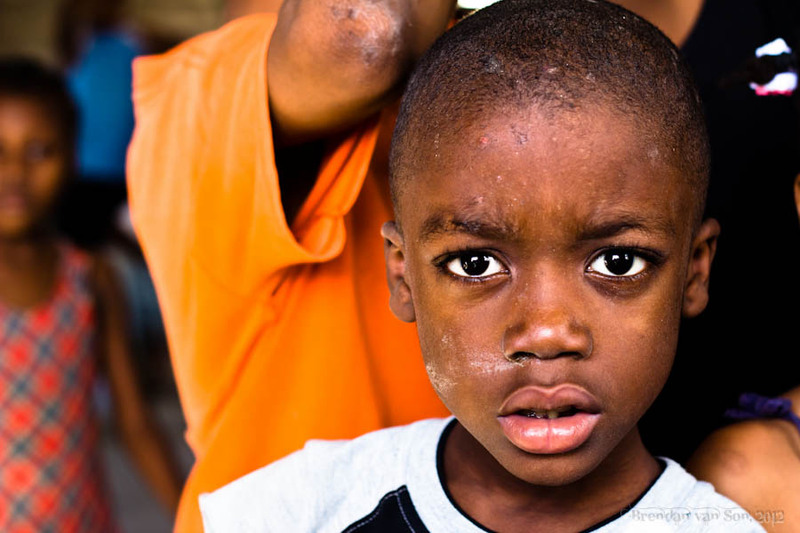 I shot this image at f/3.5 which is was wide enough to give nice depth to the image but narrow enough to make sure that the entire Haitian boy’s face was in focus from nose to ears. I shot the image with a shutter speed of 1/125, when I shoot wildlife or people I always try to get my shutter speed to about 1/100 to make sure everything is sharp. You did a great shot here..Hope you win in this contest..Thanks for sharing this to us..